More snow was forecast through the weekend in those same areas. MARQUETTE, Mich. - Parts of Michigan's Upper Peninsula have received more than a foot of snow in the first major snowfall of the season. The National Weather Service measured nearly 10 inches of snowfall Saturday morning in Marquette since Friday morning. 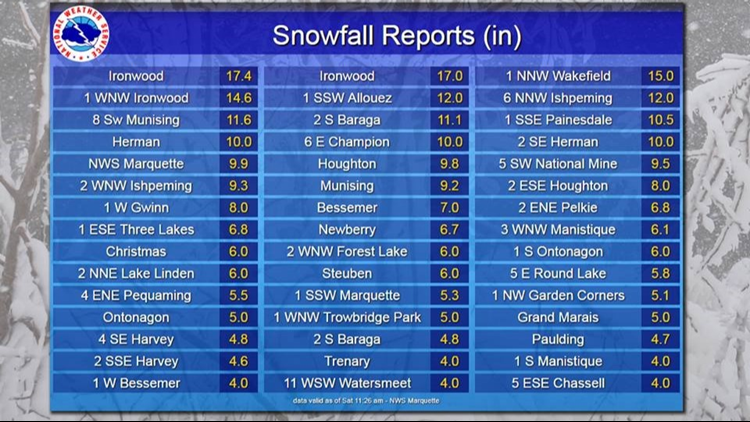 The weather service received reports of 17 inches of snow at Ironwood, with nearly 12 inches at the community of Munising. Snow totals varied widely across the Upper Peninsula from what the weather service said was lake-enhanced snow. State police reported poor visibility on Upper Peninsula roads from high winds blowing snow around. Snowfalls of 3-6 inches were reported in northern parts of the Lower Peninsula.